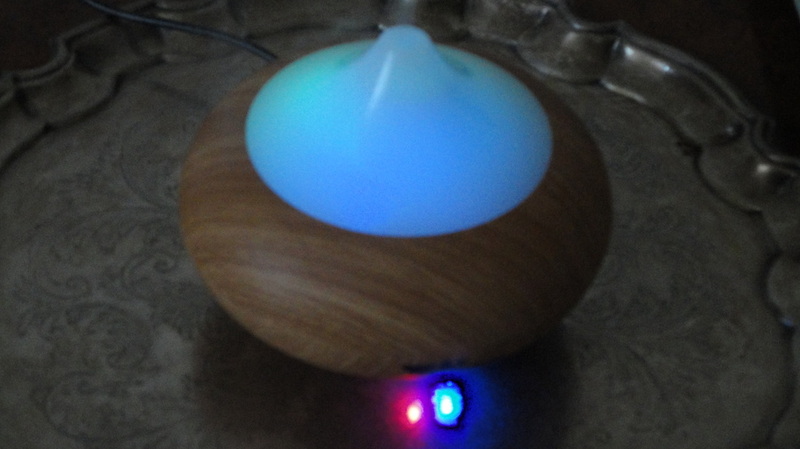 Aroma diffusers have become an affordable luxury. Since I got my original one, a year ago, I have been using it almost every day and often wished I had another one. When E-Prance proposed this different model for evaluation, I was very happy to accept. I like the simple but elegant shape and, of course, once lit it looks gorgeous in low light and can illuminate a dark corner in a fascinating way. The steam generated is quite substantial, very useful in winter when indoor air tends to be dry, but the main benefit is the subtle diffusion of the essential oils added to the water in the reservoir. My collection of essential oils includes aromatic and therapeutic ones, especially those that target air quality and respiratory difficulties, and I love to mix and experiment. It's impossible to go wrong! Please remember that our sense of smell diminishes when we are exposed to the same scent for a period of time, so it is normal to no longer be able to smell the perfumed air after a while. The oils are still working, so don't be tempted to add more. I normally just use a maximum of 8-10 drops per cycle. Also be careful with citrus oils (lemon, grapefruit, bergamot, orange) as they can corrode the mechanism. I use them but in combination with others. Everything you need is in the box, except the oils. The unit itself, a power adapter to plug into the wall, a measuring beaker for the water and a reasonably clear manual in English. 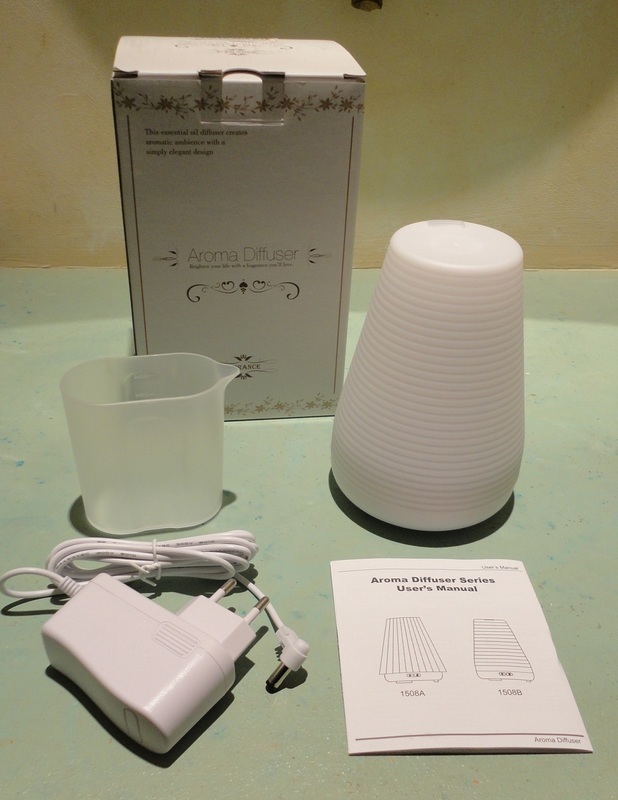 This diffuser is really easy to use (as per video). The top opens by twisting and lifting, you add 100 ml of water, a few drops of the oils of your choice, twist the top back on, plug in and you are ready to go. The left button switches the unit on, the right one starts the steam and LED light show. You can let the diffuser cycle through the whole spectrum of seven colours, or choose your favourite one and make it brighter. There is also an option to turn the light off completely. A small light indicator signals one of two modes: 3-hour duration steam (green light) or steam until the water runs out (red light). I like the safety feature: when the reservoir is empty, the diffuser switches itself off – and it does run almost dry, unlike my other one. You can also pause and restart operation by pressing the left button, or just have the mood light on without steam. I was relieved to see that the top is made of plastic instead of glass because of my cats, much safer this way. It also has one of the largest tanks I have seen, which lasts about 4 hours. It runs quietly, the only thing I noticed being an initial water dripping noise, and it remains cool so that the oils are not altered by heat. I am really impressed with the simplicity of use and performance of this pretty diffuser, and the light show is really gorgeous. A full reservoir will last over three hours, then the humidifier stops automatically and a red light blinks to indicate that it needs topping up. Be careful removing the top lids because there will be a lot of liquid still left but below the sensor level. Apart from the lovely perfumed ones, it can be used with essential oils (like eucalyptus) that purify the air and help people with allergies or respiratory issues. It would make a lovely gift, or just be nice to yourself! I had been looking everywhere for an essential oil burner when I was offered this cool-looking aroma diffuser to test and review. The first thing that struck me was the shape. So smooth and organic, like a large flower bud. As well as solid black or white, it is available in two wood finishes: the light blonde one I selected and a much darker one, which looks amazing, too.